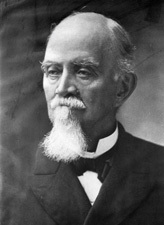 PETTUS, Edmund Winston, a Senator from Alabama; born in Limestone County, Ala., July 6, 1821; attended the common schools of Alabama and Clinton College in Smith County, Tenn.; studied law; admitted to the bar in 1842 and commenced practice in Gainesville, Ala.; elected solicitor for the seventh circuit in 1844; served as a lieutenant in the Mexican War; again solicitor 1853-1855; elected judge of the seventh circuit in 1855 but resigned in 1858 and moved to Dallas County; resumed the practice of law; served as envoy from Alabama to Mississippi during the formation of the Southern Confederacy; entered the Confederate Army as major in 1861; was made a brigadier general of Infantry in 1863 and served until the close of the Civil War; returned to Selma, Ala., and practiced law; elected as a Democrat to the United States Senate in 1897; reelected in 1903 and served from March 4, 1897, until his death at Hot Springs, Madison County, N.C., July 27, 1907; interment in Live Oak Cemetery, Selma, Ala. Dictionary of American Biography; U.S. Congress. Memorial Addresses. 60th Cong., 1st sess., 1907-1908. Washington, D.C.: Government Printing Office, 1909; Watson, Elbert L. "Edmund Winston Pettus." In Alabama United States Senators, pp. 91-94. Huntsville, AL: Strode Publishers, 1982.